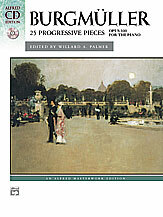 Burgmüller’s most famous work, the 25 Progressive Pieces, are short compositions with descriptive titles. Easier than his Opp. 105 and 109, each selection exposes students to a different technical challenge with the main emphasis on the phrasing, articulation, and dynamics often found in Romantic piano music. The collection includes “Arabesque” and “Ballade,” both popular with many early-intermediate pianists. The Alfred Masterwork Library CD Editions conveniently combine each exceptional volume with a professionally recorded CD that is sure to inspire artistic performances.